The Shiner BBQ VIP Sweepstakes is open only to all legal residents of the United States of America who are 21 years of age or older. The Shiner BBQ VIP Sweepstakes ends on November 10 at 11:59 p.m. Central Time. 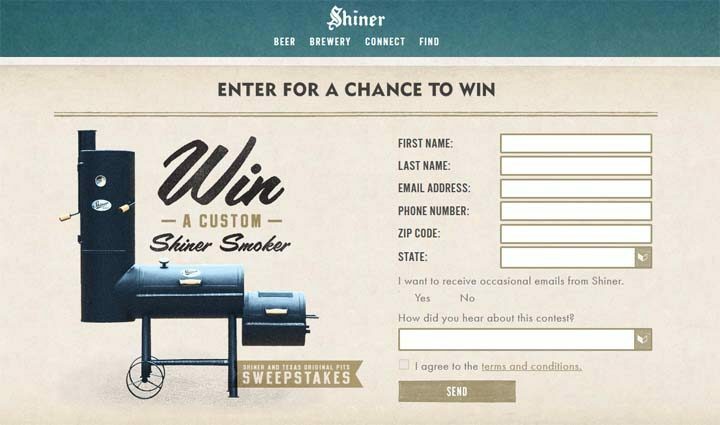 To enter go to shiner.com (shiner.com/smoker) to complete the entry form. Limit of one entry per day per person or e-mail address. Five (5) Prize winners will receive Shiner branded Texas Original Pits Smoker with Firebox (retail value $1,500).